I see his Strava marathon best perf is 3.20 currently but in that session (his first run from the beach in California) the marathon split was shown as only his 3rd best so there must be two sessions with faster marathons - did they get deleted? The backup account has a 3:11 thon I believe. Is anyone here a registered poster on Runners World? If so, is it possible for you to try to contact "Doubly Bionic Ironwolf" who first posted about Rob's result in 2004, and is still active on the forums? He / she may be able to shed some light on how they heard about that result. I'm confident I have the right results listing as Tracey Haseldine and Louisa Edmonston do appear, the other runners DBI refers to. Possibly another DQ for our Mr Young? Probably wasting our time, but I have contacted the organisers of the triathlon for the the full results. It easily has to be most poorly recorded "European Championship" event ever. I don't doubt he completed it, but we may find he was 3rd fastest out of 3 for his age group (a la RAUSA). Incidentally, I live local to him in the UK (I go through Richmond Park twice a day to/from work). I would be happy to meet with him on his home turf for a LRC exclusive interview. Saving that, I could just defecate on his lawn? If he was 3rd in his age group, I assume they would have listed him, since other age groups have up to 10 names. And if you go through Richmond Park twice a day, you must have met Rob dozens of times, because he was doing a lot of his 370 marathons in one year there? It's a big park and packed with runners/cyclists/triathletes. Thousands of commuters go through it each day. My post to his FB about the miracle 25.5mi uphill segment at sub-6:00 pace got scrubbed. Let's see how long til they take this one down. I have some hope that he and the panel will understand that it is a FACT that the original data has cadence and resides elsewhere, and the deliberate withholding or obfuscation of the original data is highly suspicious and is an action tantamount to cheating requiring severance of the sponsorship. The liar and cheat Mike Rossi likes to say his accounts are hacked. I'm sure it is on Robbing Rob's radar. I randomly clicked on a few of the links he posts to Strava (in a FB post with at least 100 different links) and one has been deleted. So I commented asking why it had been deleted - I don't expect a reply but it doesn't make sense if he has nothing to hide. Time to email Jaimie again perhaps and point this out? Was RY using a fake Facebook acount, "Lambert Skiles"? 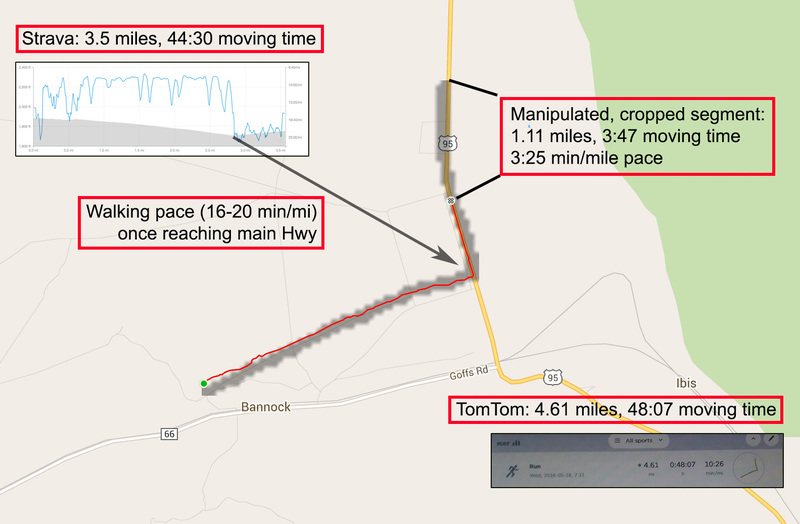 The data uploaded to the Joanna Strava account clearly showed it was a TomTom device. That loaded to the rob Young account was .gpx files (so no time of day). Look at some of the screenshots I posted to imgur - both types are in there. His TomTom is def one that shows cadence. He won't want that showing as the watch was riding in the RV not on him for many miles! "it would have been close to beating the greatest runner ever Yiannis Kouros and that is not happening anytime soon"